A book-mash is a random stacking of books with spines facing front. The titles tell a lot about the bookowner. 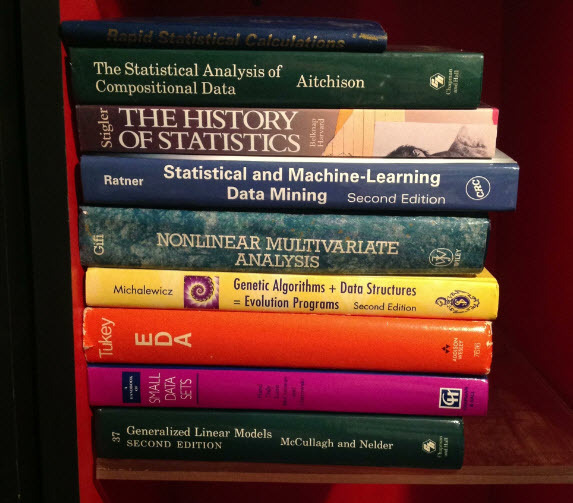 The picture of my lowly statistics book-mash, below, is so incomplete due to the loss of my 1,000 plus books washed away by hurricane Sandy on October 29, 2012 at 12:30am. But, it is still my book-mash. What does you book-mash look like? Please email at br@dmstat1.com.